When I first started getting into makeup, one of the initial items I purchased was eyeshadow primer. There are many options to choose from, with some of the most popular being Urban Decay Primer Potion, Nars Eyeshadow Base and Toofaced Shadow Insurance. Recently, I wanted to test out the inexpensive competitors to see if they could compare. 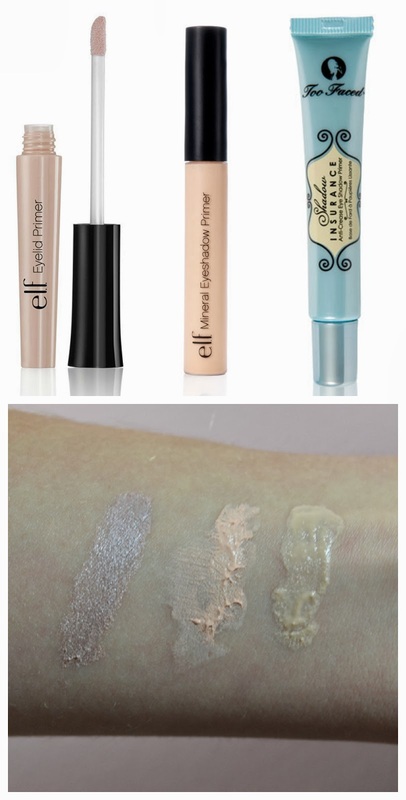 I've been pleasantly surprised by e.l.f's eyeshadow primers, featured in the image below, compared to the Toofaced Shadow Insurance. Now, why do you need eyeshadow primer when doing makeup? These thin creamy products work as anti-creasing bases for your powder eyeshadows. They inhibit your skin's natural oils from causing your eyeshadow to move around, smudge and collect in the creases of your eyelid. Naturally, more expensive options will last for 12 hours+ with the cheaper competitors lasting around 6 hours, with very little shifting of the shadow on top. I was not a huge fan of the e.l.f. Essentials Eyelid Primer in Champagne- $1, because the lasting power was the worst out of the bunch. I would recommend the e.l.f. Mineral Eyeshadow Primer in the shade sheer, since it seems to have a stronger lasting power on my lids. It is also marketed to be 100% natural. Where application is concerned, squeeze tubes tend to be the most convenient packaging for cream products. The two e.l.f. primers are packaged with doe-foot applicators which work fine, but aren't the most convenient for when the product starts to get empty. Overall, unless you wear makeup on a daily basis or have very troublesome eyelids, one of these cheaper e.l.f. alternatives is a great way to go. The more expensive primers are only "good" for one year after opening, then the product starts to separate, change consistency and work less effectively. I have not yet found a Canadian drugstore alternative to high end eyeshadow primers, but I will be sure to highlight one when it is discovered. Where e.l.f. is concerned, they now have a store in New York and have products in American Targets. Their online shopping is great and they frequently have some super saving days. If you are interested in a few products, $8 shipping isn't a big deal. I have seen some e.l.f. products in Winners stores in Ontario, but their stock is very unpredictable. Keep that eye makeup looking fresh, beauties!